Goals: To optimize supervisory mentorship in graduate student research progress and professional development aimed at reducing times to completion. 1) Faculty who currently have or are planning to train graduate students. 2) Faculty who are interested in establishing their own graduate professional development workshop series, course, or program for their department. Registration for all these workshops is first serve basis due to room capacity (40). 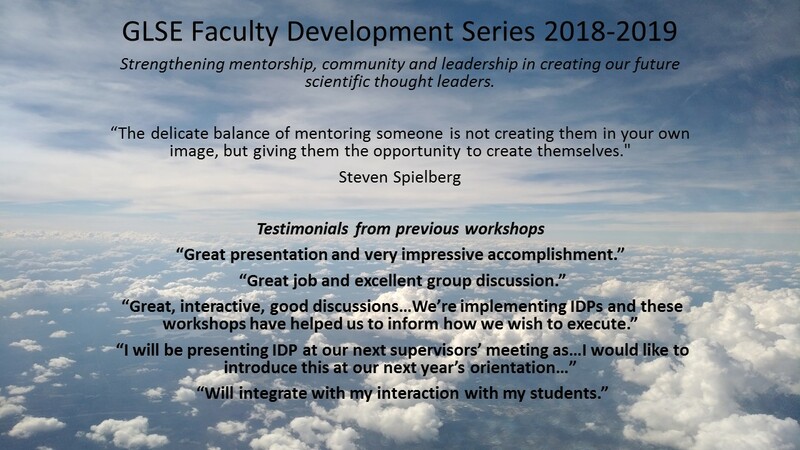 This Innovative Graduate Faculty Development Program is being coordinated by Dr. Nana Lee, GLSE’s newly appointed Director of Mentorship and GPD, Director of Graduate Professional Development, Departments of Biochemistry and Immunology. She is also a Co-Author of Success After Graduate School 2016 with Dr. Reinhart Reithmeier. Liam O’Leary and Nana Lee, recently trained at Stanford’s University Life Design Studio http://lifedesignlab.stanford.edu/studio/ will share design process principles to promote engagement, teamwork and creative ideations among your students, lab members and yourself. Liam O’Leary and Nana Lee will provide the tools, model ideas and interactive exercises from Stanford’s Design Studio to implement in your own lab or classroom with principles continued from December’s workshop. How to navigate possible influences of implicit bias on supervision and mentorship in higher education. All GPD faculty and staff are invited to share milestones, impact stories, best practices and next steps. Nana Lee will be sharing her new models in her 2018-2018 GPD classes. Register for one or all of these workshops.